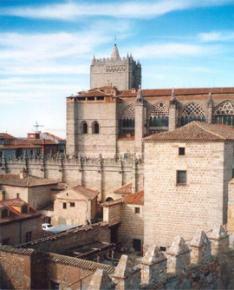 Avila is the capital of Castile-Leon in Spain. This beautiful city is a World Heritage site and one of the finest remnants of Europe's medieval era, the walled town of Avila was sacred to an ancient Celt Iberian culture long before the arrival of the Romans or Christians. To learn more about Avila and to prepare your stay in our city this Avila Guide will take you around the museums, monuments, art galleries, restaurants, shops, bars, night clubs and much more places and attractions to see, providing you useful factual information, pictures, street views, maps, opening times, entry fees to help you prepare your stay in Avila. History of Avila: few informations about Avila through time. Avila today - Facts and numbers: population, phone, language, money, time zone..
Saint Teresa of Avila: few facts about Saint Teresa of Avila, her life.. The cuisine in Avila: Avila has an authentic tradition of cuisine to discover!! Madrid is only one hour away.. Buy Real Madrid football ticket with official agent. Book your hotel in Avila: best accommodation from budget room to luxury hotels in Avila. Copyright © 2019 Avila.com. and its content partners. All rights reserved in all formats known and unknown.